A chouette is backgammon for more than two people, and is thus a more social form of the game. There can be three, four, five, or even more players. At the beginning of play all the participants roll one die. The player rolling the highest number is “the man in the box” (or, more simply, “the box”), and he plays against all the others. Joel Harwood, Les Bart, Mike Senkiewicz, Kent Goulding, and Mike Carson chouetting in 1977. The man rolling the second highest number is “captain” of those playing against the box. The third highest roller becomes player number one, the fourth highest player two, and so on. They are the captain’s partners and, while they may consult with the captain over the players, they are bound by his decisions — except that when the man in the box offers a double, each player may accept or reject for himself regardless of what the captain does. If there are any ties in the rolls, the dice are rolled again by the tied men only. The final order of numbers determines the player’s positions. Throughout the sesion the players maintain a definite order. The winner of each game always becomes the man in the box for the next game. If the captain wins, he takes the box; his opponent goes to the foot of the line, becoming the last player of the opposing team now. Each of the captain’s partners moves up a place, so that player number one now becomes captain, and so on. If the box wins, the man in the box remains there, but the losing captain goes to the foot of the line and each of his partners moves forward one place as before. Any additional players who may join the game come in at the bottom of the line at the start of a new game. In scoring the game, the man in the box plays against each of his opponents separately. If he wins a one-point game, each of the other players loses one point to him. If he loses, he loses one point to each of them. Thus, if he loses to three players, he loses a total of three times the stake; if he wins, he wins three times the stake. When the box doubles during a game and the captain gives up, some other player or players may decide to take the dsouble. The senior accepting player then becomes the captain and continues playing the game. If he wins, he gets the box and the others continue their normal order of rotation, except that the losing man in the box takes the foot of the line while the captain who refused the double takes the next to bottom spot. If a man who accepts the double and plays on loses, he does not lose his place in the line. Any player refusing a double has no more interest in the game and may no advise the captain further. Suppose the box is playing against a captain and players one, two three, and four, the man in the box doubles, and players to and four are the only ones to accept. If the box wins, player one becomes captain; player two becomes number one, player three becomes number two, player four moves to number three, and the captain goes to number four. If player two, the senior man who tooke the double, wins, he gets the box; player one, who refused the double, still becomes captain; number three becomes player one; number four becomes player two; the original captain becomes number three; and the losing man in the box becomes number four. In a chouette, the captain and his partners tend to double rather quickly. The idea is to put money pressure on the man in the box. So the man in the box is likely to be a trifle slow with his doubles, since he must consider potential redoubles. However, somehow or other there usually seems to be a certain chouette intoxication. The same man who doubles very slowly in a two-handed game is apt to spin the cube around like a top in a chouette. In more complicated situations the captain might move his men but leave the dice on the table to give his partners a chance to speak their minds, or in very tough situations he might even ask for suggestions. Too much argument in a chouette is silly. You ought to speak up any time your partners are overlooking an outstanding play; but in those situations where the play suggested by the captain is just about as good as the one you like, let the captain decide. For example, suppose 5-3 is the opening roll. You prefer moving two men from the black twelve point to your eight and ten points, but the captains wants to make the three point instead. Let him have his way without saying anything. His play is just about as good as yours; and if you argue here, he and your other partners may not listen to you when later in the game you have something really important to say. If a player leaves the table during the progress of the game, he should ask one of his partners to act for him. If he fails to do this, he automatically goes along with the captain’s moves. Unless he has announced that he is leaving the game or that he wants to be out temporarily, he remains one of the palyers against the box until he returns, except of course that he cannot become captain. Thus, he moves up in line until he becomes number one, and retains that place until he gets back. If he remains away for a long while, the other players have the right to drop him out of the game entirely, although in this instance he should take the precaution of asking to be left out temporarily after the game currently in progress is finished. In either case, when he comes back he is treated as a new entrant in the game and goes to the bottom of the line. For some reason, everyone seems to want to be in the box in a chouette. Theoretically, the box has the worst of it for two reasons. First, even the very best players overlook the proper move on occasion; when several palyers consult there is far less chance of such an oversight. Secondly, the box is alwyas under pressure since he is playing for several times the stake of each of the other players. Nevertheless, a winners want the box in order to win a lot more; a loser wants the box in order to get even. Thus, we frequently find players taking very bad doubles in an effort to hold the box or to gain the box. No opponent really objects when teh box takes a bad double (since all the other players in the game stand to gain from his mistakes). But it is quite annoying to have a lone player take a double and keep everyone else out of action for a long time. Some games have a special rule to cover this, stipulating that if just one man takes a double when there is still real contact between the opposing sides, he drops to the bottom of the line if he loses the game. This won’t stop the captains from taking bad doubles, but it certainly has a deterring effect on the other players. 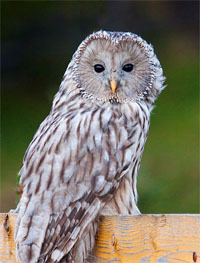 The partners in a chouette do not always see eye to eye with one another about doubling. In fact, the seldom do. When the box doubles, we have seen some players drop out, others accept doubtfully, and still others accept eagerly. We have seen times when the captain wants to double and none of his partners wants him to do so, or the absolute reverse. The captain has the right to insist on doubling, but he seldome does so if he partners ask him to hold back. Or if he does double, he may offer to buy out any of his partners who don’t want to go along. He does this by paying each of them the undoubled stake. Thus, if the captain wants to double from 2 to 4, he pays any unwilling partners two points each and takes over their games and stakes. The box has the right to pre-empt any deals between partners. Thus, if the captain wants to buy out his four partners, the box, instead of the captain, may pay all or some of them off. This has the effect of letting the box accept the double without taking on the full liability that goes with it. It is pretty good policy for the box to make a slightly unsound double (or at least one that he considers slightly unsound!) if he expects to drive one or two opponents out of the game. If he double succeeds in doing this, he has obtained an excellent result at this stage, even if the game swings against him later on. As we will discuss in detain in the next chapter, a player may settle his game at any time. Suppose the players have doubled to 8 and their game doesn’t go very well. Now a player may offer to take one point and get out. The box may counter by offering to let him out, or he may ask for one or two points. All such offers by a player or by the box are binding until withdrawn or a roll has been made. Furthermore, an offer by a player may be accepted by any one of his partners, in which case that partner would be responsible for two games. But even after an offer has been made and accepted between partners, the box may pre-empt. When the box offers a proposition to a specific number of players and mnore than that number accept, he is not bound to do business with the extra accewpters. In such cases the first ones to accept his offer are accommodated. When the box doubles, two player may do a “drop-take.” In other words, they agree to accept one double jointly and to drop the other. In the even of a drop-take, both players reaming in the game, unless the chouette has a local rule to the effect that just one partner in a drop-take must play out the game by himself for the partnership. When there are seven or more players in a game, and for some reason they don’t want to make up two separate games, the box may take a partner. The partner has full rights of consultation, and he shares equally in the profits and losses. When the box and partner double, each opponent may drop out or not as he chooses; when the box is doubled the partner may drop out, but in that case the box collects the points his partner pays out and then must play on for the full doubled stake. Similarly, if the box drops out and the partner accepts a double, the partner collects from the box and plays for the full doubled stake. Any player except the captain may become the box’s partner. A player may refuse the box’s invitation to be come a partner. The partner loses his place in line; when the box loses, the partner takes next to last place and the box last place. The box is not required to take a partner. The following incident happened in a seven-handed game in Lucaya, in the Bahamas. 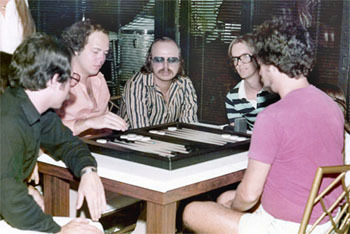 Porter Ijams (one of the best backgammon players in the world) was one of six against the box. They had doubled to 8, and at one stage of the game Porter sold his game to one of his partners for six points. This left him out of that game with six points in the bank. The box was playing for fourty-eight points (eight points times six players); a couple of players later, Porter agreed to take a half interest in the box for six more points. This left him twelve ahead, and playing for twenty-four. A little while later, Porter and his new partner (now the box) redoubled to 16. Three players dropped out and three accepted, whereupon the box asked Porter if he would take the twenty-four points paid by the refusers and let the box play on against the three who had accepted the double to 16. Porter agreed, and chalked up a total thirty-six points to his credit in the ledger. To prove what a genius he was — the box finally lost the game!